In our book, the People Side of Business, our sixth principle is that individuals are different. For us this means that you want to capitalize on these differences by finding the right fit for your employees and by seeking diversity in your workforce. Another implication of individual differences is that there are a small percentage of people who are so different that they are developmentally impaired. These impaired employees don’t follow rules, make excuses for failed performance, argue when corrected, and are counterproductive. They struggle to fit into an organizational culture and require an inordinate amount of time in supervision. These are the (non)workers who drive managers nuts. Initially it can be very hard to assess developmentally impaired people. They are very good at presenting themselves as high functioning and technically competent. In fact, they often appear especially competent or confident during the hiring process. They mask their own self-doubt and express without reservation an ability to handle the most challenging problems. Early in their tenure they can maintain their facade of superiority, but events usually catch up with them. They typically bite off more than they can chew, and as this becomes apparent, they reveal the deep-seated developmental and emotional problems that caused them to overestimate their abilities in the first place. Their sarcasm, their deflection of blame, and their refusal to cooperate are all stratagems they use to try to maintain their inflated image and hide their failings. How do you get these people to change? Well, in my book, you don’t. Remember, it’s not your responsibility to get anyone to change. You can create a supportive environment so that people have the opportunity to develop and grow. And if it’s possible, you can reconfigure their positions so that someone with a specific personality problem has a better chance of succeeding and serving the organization. But getting people to change is not part of your job description. It is up to them to contain themselves and do their jobs. As a psychologist business consultant this is probably the most common problem that prompts a call for my consultation. A careful differentiation must be made between a dysfunctional work environment causing an employee to react and an individual poisoning the environment. More on assessment and intervention in my next posts. We hear so much about diversity in the workplace today. But do we understand it as anything more than equality for racial, gender, or sexual orientation differences? As psychologist-business consultants we encourage our clients to believe in equality… and the advantage diversity brings for organizational success. You see, the first principle of the people side of business is acceptance of your employees. A culture that builds on the fundamental notion of accepting human design and uniqueness will not only accept people who look different, it will welcome people who think differently. Embracing diverse ideas and perspectives is the key to organizational success. It is much too easy for a “company line” to develop in an organization. If no one can question the standard operating procedures or offer new solutions to evolving problems the organization will grow stagnant and outdated. Other organizations utilizing the power of creative thinking will eventually outpace and outperform the “one size fits all” company. And you never know where the new ideas, processes, or solutions will come from. They may come from a woman who brings a softer touch to corporate policy or a racial minority who understands a customer base better than others. The new idea may come from that quirky artistic person who doesn’t quite dress like everyone else. You want creativity and diversity of perspectives in your organization. Maintaining an open, accepting culture can seem more complex than having that solid, rigid platform for carrying out the mission of the organization. Not only must you be open to new ideas, but you must have systems for coalescing them into a coherent strategy for doing your work. This is the big advantage of working through teams I discussed earlier. Everyone can come to understand that while they have input, once decisions are made, their job is to come together, back those decisions, and work for the common good. An organization needs people from different backgrounds. They may be different because of race, gender, sexual orientation, or ethnic background. Diversity enriches the intellectual, social, and cultural environment of the organization and enhances the organization’s ability to define and meet its goals. Diversity is an asset for the organization as long as people are willing to reconcile their diverse perspectives. Individual personality differences in your employees, and their differential responses to the support and structure you provide, is fundamentally a great asset for your organization. But a small percentage of your workers who are very different – ones who are developmentally impaired – will be major headaches for your organization. Different personal styles and skills are needed for different positions in the organization. Carrying out your corporate mission involves job functions that not only have different skills, but also require quite different personalities. And many of those jobs require emotional capabilities as well as intellectual ones. For instance, financial positions require people who like to attend to business and possess a facility with numbers. More often than not these detail-oriented folks are not your best interpersonal relaters. Other jobs require a high degree of interpersonal sensitivity and emotional intelligence, such as those in social services. Some positions require a fair amount of technical expertise. There is no one optimal person for all the jobs in your organization. In my consulting I see that most businessmen have this aspect of our sixth principle clear in their minds. They understand the critical need to find the right roles for people. They don’t try to make people what they aren’t, but find the right jobs that fit peoples’ strengths. But it is not always understood that this principle also means that diversity is a key to organizational success. Diversity is often misunderstood as a good thing to do because it is politically correct or fair. It is fair, but it is also what is needed to solve complex problems. Organizations will thrive if there are diverse ideas, from a diversity of employees, for solutions to problems and responsiveness to customers. Finally, understanding the implications of individual differences will allow you to identify and manage the small percentage of employees who struggle to fit into an organizational culture. You’ve met these employees: they tend not to follow rules, make excuses for failed performance, argue when corrected, are counterproductive, and require an inordinate amount of time in supervision. More on utilizing and managing individual differences in my coming posts. You’ve heard through my posts what people are and what they need in the workplace. Taken as a whole, people share all the attributes I’ve described in the first five principles. They look for safety and security, for instance, and they welcome the opportunity to grow and achieve mastery. How individuals express these attributes, however, depends a great deal on their personalities—the product of their genes, brain structure, and formative experiences. Some individuals are more intellectually gifted, while others are more socially savvy. Some are introverted, while others are extroverted. Put simply, the people side of business requires you to understand how people are different. It is our sixth principle. For instance, people respond uniquely to the application of support and structure. People will have their own reactions to the characteristics of their managers and leaders. This can be a wonderful source of richness for the organization (through the diversity it brings) or the nightmare of a really troubled employee. Despite your best efforts to provide a healthy work environment, people will respond differentially. If you ignore personality and treat people as if they were indistinguishable, you will fail to accept each person’s individuality. People will not feel cared for or safe in their jobs. Feeling cared for requires that the person be seen as special in some unique way. When you see people alike, you will not harness the talents of your employees. Each person has signature strengths that should be utilized for the good of the company. You also will allow less competent people to slip by. The tendency is to assume that everyone will function similarly. This is a mistake. Each person, with their unique strengths and weaknesses will have skills that need development and difficulties that they need help to see and correct. Different personal styles and skills are needed for different positions in your organization. One size does not fit all. Critically, understanding individual differences makes it possible to have the right people in the right jobs throughout your organization. More on individual differences next time. Strategic planning is essential not just because it reflects the business plan of an organization, but because it is also a key component of the people side of business. A strategic plan lays out the mission and pathways to achieve the organization’s goals. Taking care of people in the organization requires that they are all aware of the direction of the company and intended outcomes of their work. At HerschDeMaio our focus is on the people side of business; in particular what managers and leaders can do to take care of their employees and create a high performance organization. Our principles thus far have been about the support and structure people need. For the support and structure to succeed people need direction; they need to know where they are headed. Sounds obvious, doesn’t it? All too often managers are guilty of giving people a job, and not a mission. A job is something people work at and want to accomplish. But a mission is a job attached to a greater purpose. It has meaning that goes far beyond the day to day slogging. It provides an opportunity for employee creative problem-solving and self determination in reaching the company goals. When workers both know and buy in to the mission of the organization – and they have an opportunity to determine at least some of how to accomplish that mission – they can feel like adults who have greater autonomy and self worth. Management in effect poses a challenge to them to help figure out how to succeed. This not only makes people feel good, it brings out the best performance they have to offer. Allowing some autonomy requires ongoing communication (between manager and employee) about how each person’s effort is working toward goal accomplishment. It sets up a kind of accountability and structure that is not about correction or consequence, but is about shared ideas for accomplishing goals. It is adult to adult, positive, and not personal. It sets up a relationship where management can implement a balance of active support and structure. When consulting with managers I am often asked if there isn’t some inherent conflict between being supportive with employees while simultaneously insisting on accountability. It is an interesting question especially because so many managers tend to lean to one side of the equation; some seem naturally supportive and some are more clearly authoritative. One of the most difficult aspects of leading and managing people is striking that ideal balance between nurturance and structure. It is at the heart of great leadership. You want your staff to know that you care and that they can function like a family, but you do so because as a business leader you know that family-like structures enable people to work comfortably and optimally. But as I’ve said before, a business is not a family and you’re not a parent. Each business has a mission and people who are part of the business must be held accountable to accomplishing their jobs. In a family, you are rewarded just for being yourself. In a business, you are rewarded for your performance. That’s why developing a culture that balances support and structure is so important. Your management role is to respect and care for your employees. They are the engine of your enterprise. Your management responsibility is just as much to clarify the outcomes (or corrections) necessary for company survival and success. This approach fosters autonomous, self control toward goals. It builds a commitment to the job, such that each employee “buys in” to the work mission. It allows you to celebrate victories with the large measure of employees, and sensitively hold people accountable when they are struggling to do it themselves. My previous posts described how the system of rules and outcomes – the structure – of the organization must be implemented in a depersonalized and positive manner. The goal you want to achieve is to have structure be an integral part of the organization so that it is the culture and it feels organic. You see, when structure exists unobtrusively, it is just a part of what is around employees, an unspoken code that governs the way people interact. This is organizational culture. Such structure is not experienced as an exterior set of rules or procedures; it is the way of doing business. Most of the “rules” we have for ourselves at work are just about how we should do things well. So we hold a meeting with a coherent agenda, or engineer a part properly, or perform a service according to standards of which we are proud. We wouldn’t think of doing it any other way. As every employee comes to understand that the product or service of the organization is their responsibility (and their bread and butter), they don’t need to be told what to do and how to do it. They strive to succeed because they want to do things well and to achieve mastery (our fourth principle). The job of management and leadership is really to help people learn and organize how they can succeed in their positions, individually and as teams. Company employees can and should participate in building their own structure, including systems for holding themselves accountable to essential outcomes. The way structure becomes obtrusive is when management takes responsibility for controlling how people function in the workplace. The key here is that employees have the responsibility for “controlling” how they behave and what they produce. 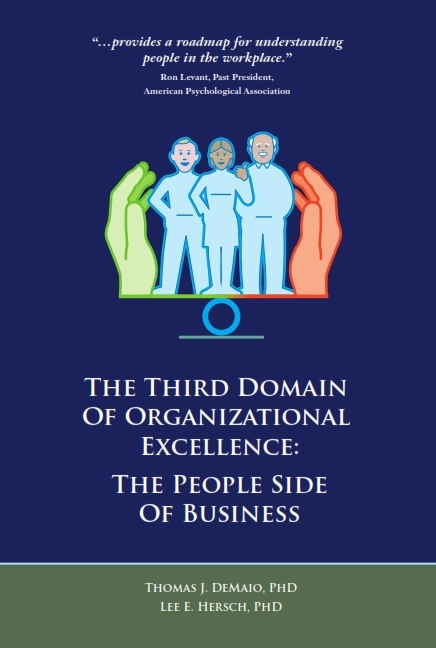 Management helps establish organizational goals so that the company succeeds. Employees need to figure out the rules (policies and procedures) needed to meet those goals. When employees see themselves as responsible for their own outcomes, it allows management to get squarely behind them with support. Employees need both the technical materials to carry out their jobs and human support. Support, in the form of acceptance and nurturance, can be provided and received so much better when there aren’t needless debates about required performance. Successful managers and companies can focus on mature dialogue about how to perform well and succeed in their businesses.